We all have things we'd like the chance to do over again but what about the things you never want to repeat? Junior high comes to mind for me. I'd never wish that on anyone more than once. 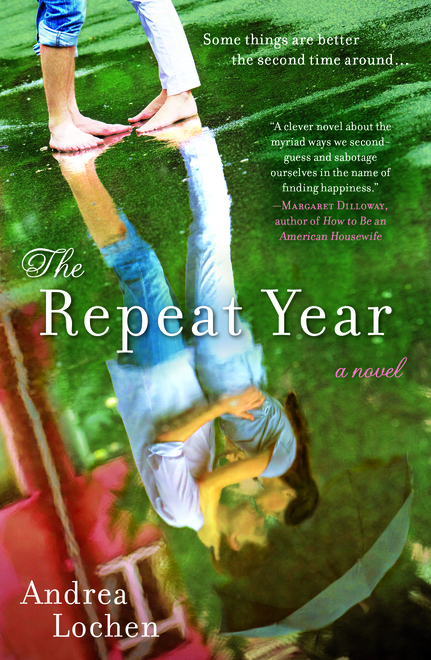 Olive Watson, in Andrea Lochen's new novel, is about to have to live over, not junior high, but a terrible year of her life, one that she really, really doesn't want to have to re-live. And even worse, she'll be doing it with the full and complete knowledge of all the mistakes she made the first time around. When Olive wakes up on what should be January 1, 2012, she instead wakes to January 1, 2011, again. 2011 is not a year she wants to re-live. She and her long time boyfriend broke up, she let her closest friend drift away, and her widowed mother married a man of whom Olive is not terribly fond. 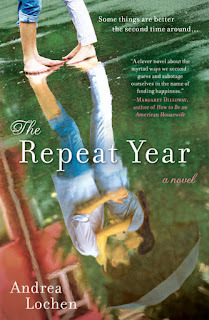 2011 was a year of unhappiness and bad choices for Olive and while she now has the chance to repair her worst mistakes, she just isn't sure she is capable of living through it all again, especially knowing what she did in the past that led her to such misery and having to try so very hard to change the outcome of her year. When she first wakes up in the bed and arms of her ex-boyfriend, she has a hard time processing what happened. And it takes her a week or so to fully comprehend and accept that she is in fact having a repeat year. As Olive starts her second go at 2011, she remembers and tries to change her reactions to the things that she feels were pivotal moments that caused her first 2011 to crash and burn so badly. And she encounters a friend of her mother's who has done several repeat years herself and to whom she can talk about the situation without sounding crazy. But Sherry, her mother's friend, is not a fairy godmother who will help shepherd Olive through the changes she needs to make and the realizations she needs to come to throughout the year because Sherry is having her own issues that she needs to solve in order to move herself into 2012 come next January 1. But it is thanks to and through Sherry that Olive comes to understand that this year is in fact a last chance gift and that while she can change her actions, it is much harder to change what's in her heart and it's entirely impossible to change what is in someone else's heart. Having the knowledge of each thing that she did or said, each hurt she doled out in the previous 2011, gives Olive the chance to truly examine what drove her to cheat on her boyfriend Phil, why she reacted so badly and immaturely to her mother's remarriage and new husband, and why she allowed her friend Kerrigan to fade out of her life. She is given the opportunity to see exactly how she chose a solitary, work-centered existence instead of the love and connections that she so needed to be happy. But she cannot just undo (or rather not do) the actions from the first 2011. They might not exist in this 2011 but they do continue to exist in her memory and so those unchosen decisions still haunt her. She still has to work through their causes before she can let them go or be unaffected by them because they are real to her whether they happened or not. While many of us would like a do-over in life, the concept of having to repeat an entire year, one that was badly done the first time, is a different twist on the idea. And Lochen has written an entertaining and thought provoking novel. The characters are realistic and their reactions to events are definitely believable. Olive may come across as selfish and unthinking sometimes but that is what her repeat year is all about: changing her thinking and learning to open herself up and understand what's behind not only her own decisions and actions, but others' as well, placing her in a greater community rather than the isolated and unhappy island on which she ended her first 2011. The several different events in her past life that she has to correct are well handled with the exception of her relationship with Kerrigan, which is resolved at the end far too easily for the magnitude of the situation. But in general this is an interesting and pleasing novel about our choices, right or wrong, and the impact they have on the greater part of our lives and the lives of those about whom we care deeply. For more information on Andrea Lochen and the book, visit her webpage or find her on Facebook. For others' opinions on the book, check it out on Amazon.